This afternoon I read your post on Facebook regarding what disability rights taught you about privilege. In this post you discussed the issues of power, privilege and ignorance. You further wrote, "The fact is, people with disabilities - whether visible or invisible - face harsh inequalities. People with physical, sensory, intellectual or mental health disabilities do not benefit from the same opportunities as those without." Even with the Americans with Disabilities Act, your statement rings true. My familiarity with disability is the result of having been a caregiver for my mother - and to a lesser degree my father - and becoming disabled myself. Just to provide some background, my parent's - who divorced when I was one-year-old - each sustained an injury in 2000. Both of my parent's required surgeries, outpatient procedures, physical therapy and numerous follow-up visits with various physicians'. While I was the person solely responsible for assisting my mother, my father has several siblings who could help. In 2005, I slipped and fell in the house which resulted in a compression fracture in the thoracic region and pain in the lumbar region. In 2006, I was involved in a vehicular accident which exacerbated my previous lumbar pain. It was in 2005, after my slip and fall, that I realized the limitations of the Americans with Disabilities Act. Under the ADA a disabled person can find guidelines regarding accomodations and compliance issues that employers, businesses, public facilities, etc. must adhere to. Yet, when my physician wrote a letter - to my supervisor - making suggestions about reasonable accomodations, no accomodations were made. Accomodations, such as, an ergonomic chair and allowing me to get up periodically and move about; sitting too long aggravates the pain in my lower back. In 2006, after the car accident, I wasn't able to return to work because of my back pain. I began receiving short-term disability insurance payments which became long-term disability. My back pain got worse and I began having a problem with sciatica. I would have regular follow-up care at a chronic pain center as well outpatient pain procedures. My lumbar back pain became so limiting that my days revolved around my back pain. I'd have to frequently reschedule appointments because the pain was too intense. My back would frequently lock up/freeze in position on me; at the most inopportune moments. In the Fall of 2012, during one of my follow-up visits at the pain center, I was given a patient information packet on an implanted device; a spinal cord stimulator. In May of 2013, I had the surgery to implant the spinal cord stimulator in order to help me manage my back pain better. Having an SCS (spinal cord stimulator) doesn't mean 100% pain relief. No. I still have routine follow-up visits at the pain center and still require outpatient pain procedures as well as oral and topical pain medications and a back brace. Over the past 3+ years I've noticed something when it comes to peoples perception of what disability looks like. I've had people tell me I look okay or that I'm too young to have aches and pains. 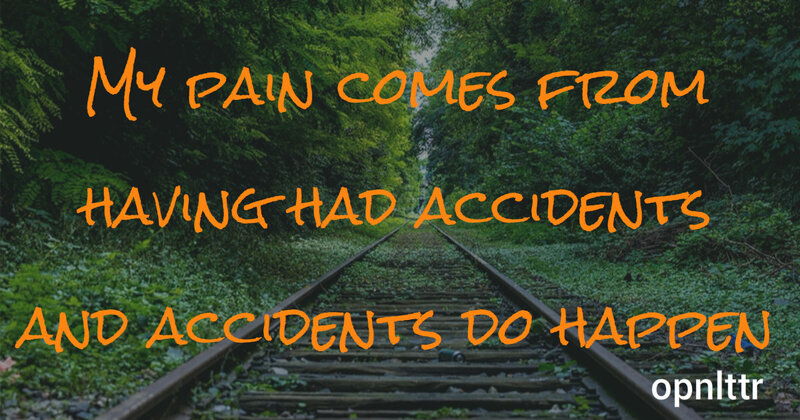 My pain comes from having had accidents and accidents do happen. Then, there's the issue of disability and seeking employment which is just as infuriating. It is against the law for employers to deny a person a job because the applicant is disabled. Yet, over the past 18 months - time and again - I meet up with recruiting and hiring practices that should not exist. I've been out on long-term disability, but I've been looking for employment because my money doesn't go as far as it used to. I have a Bachelor's of Science in Nursing degree and have applied to numerous healthcare facilities; both inpatient and outpatient. However, when the recruiter inquires about the gap in my work history and I explain same, that does it. That's the final nail in the coffin. I've had a recruiter tell me she wouldn't schedule a face-to-face interview until I got a letter from my doctor stating I no longer have any limitations. I did manage to get one in-person interview at another facility, but the recruiter spent most of the interview discussing my back injury. I knew, then, I wouldn't be offered that position. Then, there are the numerous online applications I filled out and self-disclosed that I have/have had a disability. Even though there's a disclaimer at the bottom of the screen that states if you do disclose any type of disability, this won't disqualify you from being considered, I doubt it. Every position I applied for and self-disclosed having a disability I wasn't contacted for an interview. I finally decided to move in another direction and earlier this year, obtained my license in life insurance as a part of orienting with a well-known company. However, I'm concerned about this position for various reasons. First, this is a commission-based position and I've never worked on commission before; several agents I've spoken with state it was months before they saw their 1st paycheck. I haven't any emergency fund to fall back on. Second, this company's orientation is 6 days per week for 3 years; many agents put in 8-10 hour days. The office manager is known to be in the office by 6:30 every morning and stays until 7pm or later. My chronic back pain drains me of my energy. It's a huge effort for me to get going first thing each morning as I gently get up, move around and get my various medications to help my back pain. Yet, I have to somehow make this insurance company orientation - which seems more like a hazing ritual - work because I've continued applying for other positions online, with no offers. It's truly disheartening to be disabled and then constantly be rejected for employment opportunities.